Comino (Maltese: Kemmuna), formerly called Ephaestia, is a small island of the Maltese archipelago between the islands of Malta and Gozo in the Mediterranean Sea, measuring 3.5 square kilometres (1.4 sq mi) in area. Named after the cumin seed that once flourished in the Maltese islands, the island is the least densely populated area in the Republic of Malta. It has a permanent population of only three residents, following the death of the fourth resident in 2017. Administratively, it is part of the municipality of Għajnsielem, in southeastern Gozo. One priest and one policeman commute from the nearby island of Gozo. The island is a bird sanctuary and nature reserve. 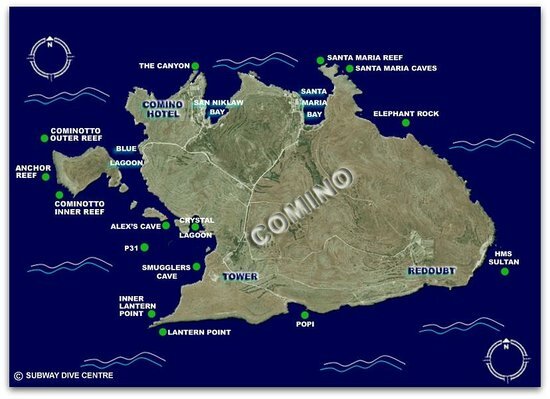 Comino is known to have been inhabited by farmers during Roman times, but for long periods in its history it has been sparsely populated, privately owned, or abandoned entirely. Its rugged coastline is delineated by sheer limestone cliffs, and dotted with deep caves which were popular with pirates and marauders in the Middle Ages. The caves and coves of Comino were frequently used as staging posts for raids on hapless boats crossing between Malta and Gozo. From 1285 until some time after 1290, Comino was the home of exiled Jewish Prophet and Kabbalist Abraham Abulafia. It was on Comino that Abulafia composed his "Sefer ha-Ot" (The Book of the Sign), and his last work, "Imre Shefer" (Words of Beauty). In later years, the Knights of Malta used this island as hunting and recreational grounds. The Knights were fiercely protective of the local game, which consisted of wild boar and hares (Maltese: fenek tal-grixti): upon conviction, poachers were liable to a penalty of three years as a galley slave. In the 16th and 17th centuries, Comino served as a place of imprisonment or exile for errant knights. Knights who were convicted of minor crimes were occasionally sentenced to the lonely and dangerous task of manning St. Mary's Tower. During the French occupation of Malta, Comino served as a quarantine and existing buildings served as an isolation hospital. On 6 March 1889 the British battleship HMS Sultan grounded on an uncharted rock in the Comino Channel, ripping her bottom open. She slowly flooded and, in a gale on 14 March 1889 she slipped off the rock and sank. The Italian firm of Baghino & Co raised her in August 1889 for a fee of £50,000. On 27 August Sultan was brought into Malta.